A team of paleontologists and engineers has found that duck-billed dinosaurs had an amazing capacity to chew tough and abrasive plants with grinding teeth more complex than those of cows, horses, and other well-known modern grazers. Their study, which is published October 4 in the journal Science, is the first to recover material properties from fossilized teeth. Duck-bill dinosaurs, also known as hadrosaurids, were the dominant plant-eaters in what are now Europe, North America, and Asia during the Late Cretaceous about 85 million years ago. With broad jaws bearing as many as 1,400 teeth, hadrosaurids were previously thought to have chewing surfaces similar to other reptiles, which have teeth composed of just two tissues -- enamel, a hard hypermineralized material, and orthodentine, a soft bonelike tissue. But paleontologists who study the fossilized teeth of these animals in detail suspected that they were not that simple. To investigate the dinosaurs' dental structure and properties in depth, Norell worked with lead author Gregory Erickson, a biology professor at Florida State University, and a team of engineers on a series of novel experiments. Erickson sectioned the fossilized teeth and made microscope slides from them. These revealed that hadrosaurids actually had six different types of dental tissues -- four more than reptiles and two more than expert mammal grinders like horses, cows, and elephants. Using a technique called nanoindentation, in which a diamond-tipped probe is indented and/or drawn across the fossilized teeth to mimic the grinding of abrasive food, the researchers determined the differential hardness and wear rates of the dental tissues. 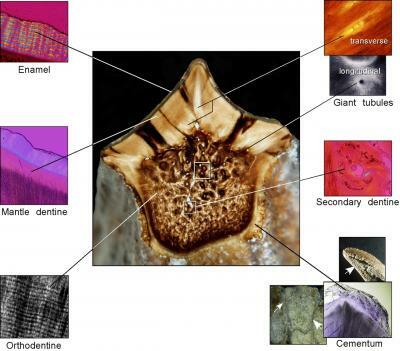 In addition to the four dental tissues found in mammals -- enamel, orthodentine, secondary dentine that helps prevent cavities, and coronal cementum that supports the teeth's crests -- the hadrosaurid teeth include giant tubules and a thick mantle dentine. These extra tissues are thought to provide additional prevention against abscesses. 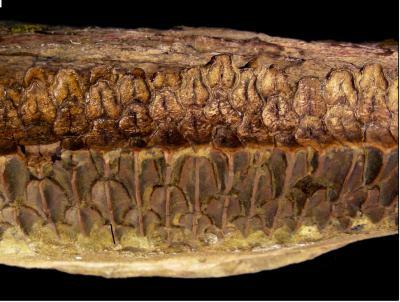 Also unlike mammalian teeth, the dental tissue distribution in hadrosaurids greatly varied in each tooth. In addition, the findings provide strong evidence that dental wear properties are preserved in fossil teeth -- an idea that was once questioned and overruled in this study with comparative tests on teeth from modern and fossilized horses and bison. This opens the door for studies on the dental biomechanics of fossils from wide-ranging groups of animals to better understand evolutionary modifications in diets.